Train and bus are the most environmentally friendly ways of getting to Ammarnäs but we are well aware that this can be difficult from certain parts of the country and then your own car might be a better alternative. Whatever you choose you’re always just as welcome to Ammarnäs. From most places in southern Sweden you catch a night train northwards and then continue by bus in the morning to reach Ammarnäs after lunch. Use the links below to find an up to date itinerary from your location. Itinerary, number of changes and travelling time vary rather much depending on season and week day so look around for an itinerary that suits you best. If you come to Ammarnäs by car you choose road 363 or E45 to Sorsele. From Sorsele you continue along route 363 towards Ammarnäs. You can refuel in Ammarnäs but consider that the distances are long so it’s wise to check how much fuel there is in the car. People from Gothenburg usually say they take route 45 and turn left in Sorsele, it’s as easy as that to find us from western and southern Sweden. Nextjet fly to Arvidsjaur (AJR) and Lycksele (LYC) from where you can continue by bus or taxi to Ammarnäs. 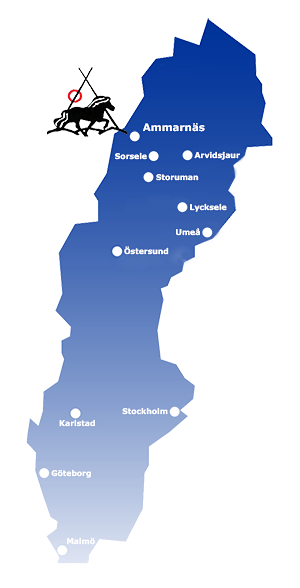 Several airlines fly to Umeå (UME) where you ideally rent a car and drive the remaining way up to Ammarnäs.